Meditation is an amazing tool to get focused, clear your head and ditch any resentments. Buy noise-cancelling headphones, roll out a mat or towel, lie down and find a quiet spot. 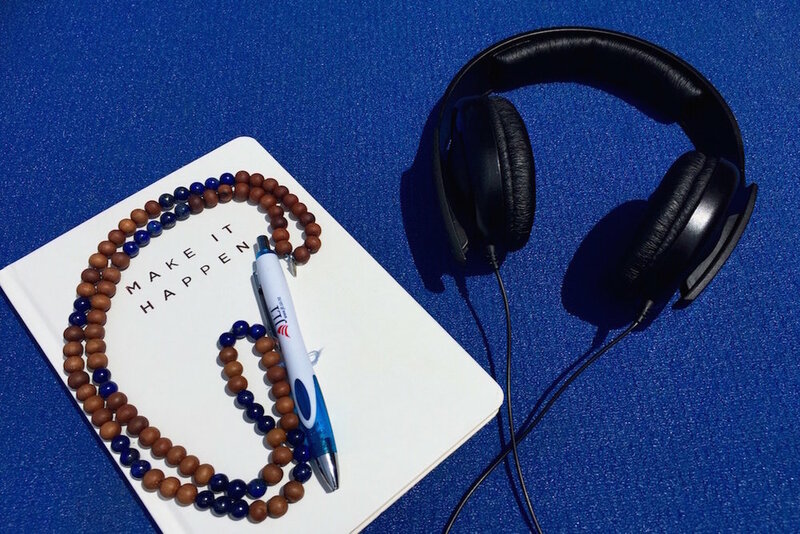 You can recite a mantra to stay on track (we love 'SA TA NA MA'), try mala beads (which you count as you meditate) or listen to a guided meditation or soothing music. The more you practice, the easier meditation gets and it's also scientifically proven to boost your brain power. Journalling is an excellent way to work through stuff by handwriting out your biggest fears and greatest desires. Find a journal that inspires you, put aside five minutes each day or half an hour each week and get writing. You'll be surprised at how quickly the process will help crystallise your thoughts and get in touch with your emotions. It may sound a little too simplistic but speak to yourself as you would to others. Be accommodating and kind. Big ups yourself when you do a good job and be more lenient on yourself if things don't go your way. Turn the self-talk in your head into a positive conversation by literally giving yourself a BREAK! You don't have to step into a gym or run lots of kilometres to enjoy the physical and mental benefits of exercise. Instead, just thinking of MOVING. And aim to do that for 30 minutes a day. It doesn't matter whether you surf, swim, cycle, do yoga or pilates or just get outside for a walk, get those endorphins pumping by moving in a way you love every day. We're all so connected in this 24/7 world that sometimes the best thing you can do for your self-care is to "drop out". Turn off your phone or wi-fi, ditch the screens and read a book or do some colouring in or get out into nature. Often the vastness of nature helps us re-connect with what matters and makes us perceive whatever problems we're facing with a truckload more clarity.